This week I had the opportunity to attend an udder dissection at a local farms in the town of Perry and Oakfield, NY. 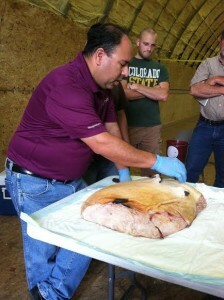 The udder dissection was an especially interesting event since the workshop was offered in Spanish and also in English! At each farm there were both English and Spanish speaking milkers, so this was a great learning opportunity for those who were able to attend. It is incredibly important for all employees to understand why certain milking procedures are followed, but sometimes language barriers may be problematic. By educating milkers about the process of the milk production in the udder, it helps to ensure the safety of the cow (and her udder) which must be a priority since she can be milked 2 or 3 times a day. As almost any dairyman will tell you, keeping the cows healthy and comfortable is directly related to milk production, which means making more money at the end of the day. At the dissection we discussed they physiology of the cow’s udder, how to prevent mastitis, and why certain milking procedures are performed the way that they are. I found it especially fascinating that each of the cows teats receives its milk from separate quadrants of the udder. I think this is something many people do not think about or do not realize! This adaptation that allows each quadrant to operate independently from the others allows milk production to continue, even if one of the teats becomes infected, or damaged in some way. Below you can see a photo of the entire udder before it was dissected. Having a strong stomach was definitely necessary for today, especially since lunch was served right after the dissection was over!